Ostensibly the sequel to Captain Chuck’s, Captain Chuck’s II in Ludington won’t skimp on its offerings. It’s not only got rods and reels from some of the biggest names in fishing, but it’s also got a wide range of “Made in Michigan” hardware to consider, allowing you to support the same state that brought you the great fishing to begin with. Throw in referrals to fishing charter services, regular fishing reports, and updates on new tackle, and you’ll have a complete one-stop shop for where to find them and how to get them. Benton Harbor’s Tackle Haven offers about all the gear an angler could need, from rods to reels to outerwear for taking on the wet environment and well beyond. But any store can offer hardware—Tackle Haven distinguishes itself with its extras. It not only offers information about area charter fishing operations, but offers regular fishing reports on area activity. Throw in a regular fishing tournament sponsored annually, and boat storage services—great for those winter months when all the fishing is ice-based—and you’ve got the total package. Welcome to Curtis, Michigan, an Upper Peninsula destination that’s home to Mick’s Bait Shop. Mick’s bills itself as “…your Upper Peninsula source for live bait, fishing tackle…” and plenty more. This includes a line of custom rods and custom tackle, including a set of patent-pending spinner baits under the Hooked on Tackle Co. brand name. It’s additionally part of the Manistique Lakes Area, which puts it within an easy hop of some of the Upper Peninsula’s best fishing spots, and will provide fishing reports to keep anglers apprised of the latest doings. Frankfort Tackle Box, found not at all surprisingly in Frankfort, boasts a sound array of lures, rods and reels to keep anglers well-supplied. Frankfort Tackle Box goes the extra mile by bringing together a slate of links about the Michigan area, including resources (ever wonder how to avoid commercial fishing nets on the Great Lakes? They’ll tell you. ), local accommodations, and even weather reports. With a wide range of options for gear—including a slate of discounted clearance items—Lakeside will have pretty much everything you need on hand. It goes on from there to present a daily fishing report from its own Captain Dan, a measure which is always welcome for those not wanting to waste a day on the water. There’s even word about area tournaments and even area hotels for those who want to stick around the area more than a day. Kalkaska is home to Jack’s Sport Shop, an operation that’s been running for over 50 years now. Named one of Michigan’s top three sporting goods stores in Northern Michigan by the Detroit Free Press, the store is home to not only a wide array of hardware but plenty of expertise on the area and its hunting and fishing operations. Jack’s is also home to a substantial array of ice tackle as well, meaning it’s ready for fishing whether the water is solid or liquid. Check out the regular fishing reports as well as the store’s blog for all the latest on fishing in the area. While it’s got a sizable lineup of fishing products, Anderson’s Probait features something a little new and different: a complete message board system online. Not only can you shop for material at Anderson’s, but you can also discuss all the latest developments in fishing technology and plenty of other topics with fellow members of the fishing community! Check out Nunica to find Fish On, a shop that distinguishes itself by offering actual fishing seminars. No, really—seminars about fishing topics, ranging from general knowledge issues to discussion of new techniques in the field. Last year’s seminar event even came with door prizes and a catered lunch for a $25 entry fee. Throw in several services on site—line spooling and repair for starters—as well as the latest in fishing technologies and you’re ready to go fishing. Bear Lake’s Osborn Sports Shop won’t just offer the full range of live bait—a staple of most any tackle and bait shop—but it will also offer the means to get at the fish. Osborn Sports Shop offers kayaks for rent, just $15 gets one for the day. You’ll need a credit card and driver’s license, but you can still rent a kayak quite inexpensively. It also offers archery and trapping supplies as well as swimming and camping gear, so you’ll be covered no matter when or where you fish and may want other material on hand as well for the ancillary sports. Over in Rockford, Great Lakes Fly Fishing Company is waiting for all the fly fishers out there. 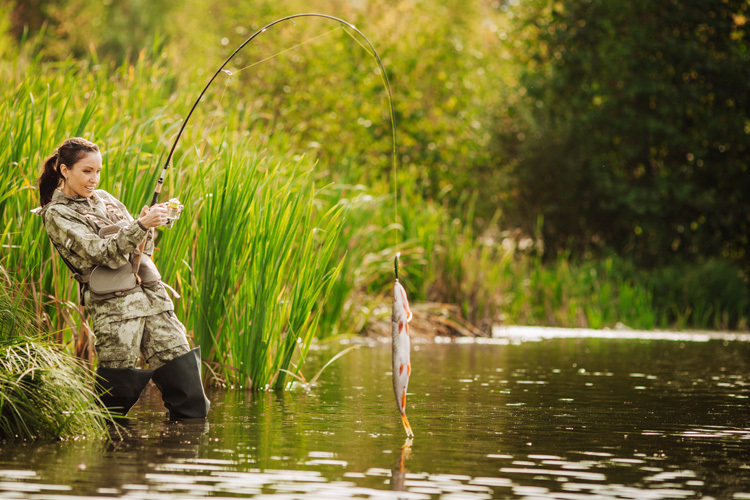 That’s especially important as Great Lakes specializes in fly fishing. Naturally, it’s got all the supplies and assorted gear one could ask for, and it also boasts both new and used equipment. It’s even got some vintage estate gear for those who think that they just don’t make ’em like that anymore. Throw in a complete line of educational products and lessons and you’ll have the fullest fishing experience right here.